Murickens' Group " The first India based iso certified mobile mortuary manufacturer." after several days of research developed a dead body freezer having all modern facilities and International technology to Preserve Bodies for number of days at home till the arrival of relatives and well-wishers. 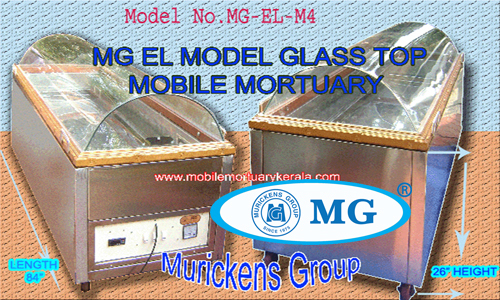 We have different models - standard model and extra large (EL).MG mobile mortuary have two type of top cover glass. First one is single sheet 10mm acrylic fiber glass model and second one is 6mm pure glass model. Acrylic fiber glass top is the most suitable model for mobile mortuary purpose because it is light weight, unbreakable and it possesses more cooling effect inside the mortuary. Due to the special design of MG Mortuary we can see the body very clearly from all of the angles. A light is fitted in the mortuary for easy visibility during night and in poor light during the day. This will automatically glow after sensing poor light. An external generator is provided due to which power failure is not a problem. Even after one week the body looks like as it is. Consumption of power is very low. MG Mobile Mortuary can be carried easily and adjust in a vehicle. ► US Technology with low maintenance. ► Dead body can be preserved for longer periods.► Stainless Steel stretcher. ► Mortuary body made-up of full pure Stainless steel and copper which provide complaint free working and long life. ► View from all angles. ► Fully automatic ► Adjustable Digital display thermo meter. ► Input voltmeter. ► Separate on-off switch for voltmeter ,lights and compressor. ► Full PUF system (New technology). ► Inner side light. ► Top door opening with side view Acrylic/Glass ( optional ). ► Attractive top door handle 4 No. ► Light weight and compact size. ► Noiseless functioning. ► Wheel mounted (smooth and strong four wheels). ► Attractive look and long durability. ► Temperature from -2oC to -20oC. ► ISO: 9001 -2015 Certified product. Available in two models Fiber glass top and Pure glass top models.